Pallas Kunaiyi-Akpanah attempts a layup. The junior forward had 16 points and 16 rebounds against Illinois. 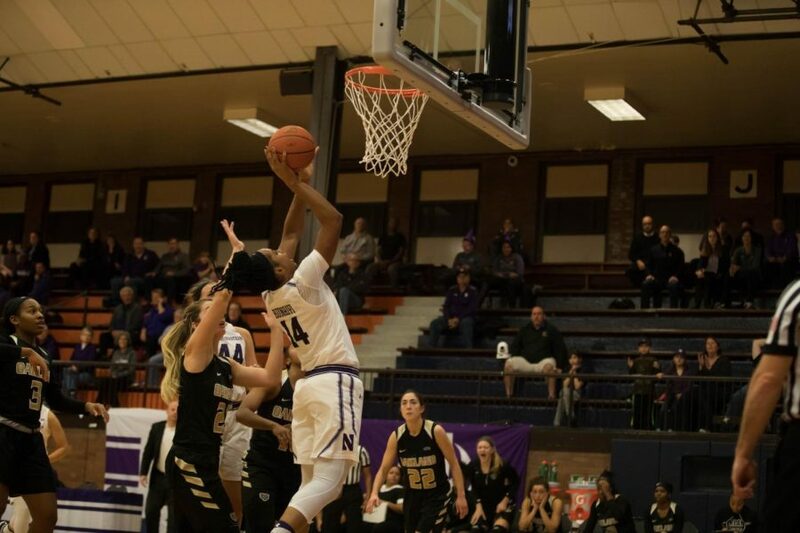 Northwestern picked up its first conference win Sunday, holding off Illinois to win 74-59. Sophomore forward Abi Scheid, led the Wildcats (8-8, 1-1 Big Ten) on the scoresheet, putting up 20 points on 7-of-14 shooting. She got solid support from junior forward Pallas Kunaiyi-Akpanah, who added 16 points and 16 rebounds. NU’s leading scorer on the season, freshman guard Lindsey Pulliam, struggled in her second Big Ten game. Pulliam has scored over 15 points per game this season, but managed only 10 while shooting 4-of-13 from the field. Fellow freshman guard Jordan Hamilton, in her second game back from injury, picked up the slack. Hamilton had 12 points and five assists on the day while committing no turnovers. For the Fighting Illini (9-7, 0-2), guard Brandi Beasley had 19 points and six assists. After a cagey first quarter, in which the teams combined for nine made field goals and seven turnovers, NU opened up a larger lead in the second quarter behind a scorching offense. The Cats hit three 3-pointers and scored 23 points in the period, taking a 35-21 lead into halftime. NU extended that advantage in the second half, building an 18-point lead with less than two minutes remaining in the third quarter. The Fighting Illini refused to go away, however, narrowing the deficit to only 10 midway through the final quarter. But time ran out on the comeback effort, and NU escaped with the victory. The Cats had struggled on the defensive end, allowing at least 90 points in three of their last four games. NU held the Fighting Illini to only 59 points on 42 percent shooting from the field. That was boosted by a lockdown effort on the perimeter that led to the hosts shooting 7-of-25 from behind the 3-point line. Illinois, however, shot only 39 percent from the field coming into the game, so their performance against NU was actually higher than their season average. Still, McKeown was pleased with his team’s defensive output. The Cats are back in action when they travel to East Lansing, Michigan, to take on Michigan State on Wednesday. This story was updated at 1:15 p.m. on Jan. 1, 2018, with quotes.